Apparently “Everybody Counts Everybody Matters,” except Karen Monahan, the ex-girlfriend of Minnesota Congressman and candidate for attorney general, Keith Ellison (DFL-MN5). The party that I worked to get elected since I was 21, has basically told my son, my family and me that our lives and voice do not matter. Protecting the powerful over the people, that’s politics. 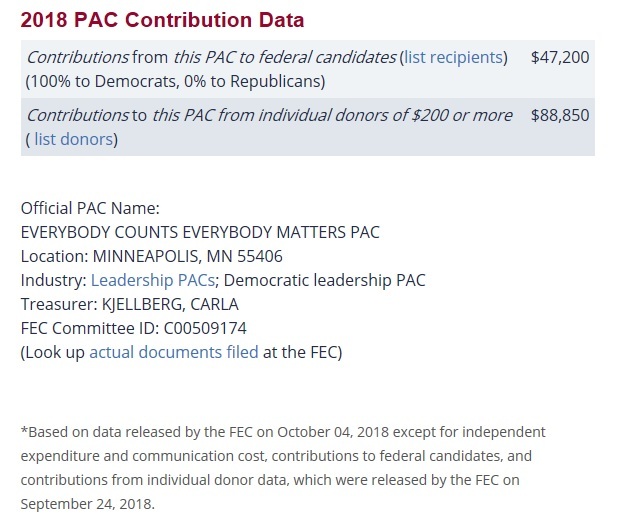 Ironically, Everybody Counts Everybody Matters is also the name Ellison’s Federal Leadership political action committee (PAC) whose treasurer is Carla Kjellberg. Kjellberg is also Ellison’s attorney and is listed as the contact person on Ellison’s law license status on the Minnesota Judicial Branch website. According to the website, it clearly stated that Ellison was not authorized to practice law because his law license was “inactive”. Ellison raised eyebrows earlier this year when he announced he was going to run for Attorney General with an inactive law license, but according to Minnesota Lawyer, he has since taken steps to reactivate it. In addition to representing Ellison, Kjellberg is Minnesota State Representative Ilhan Omar’s attorney in her divorce from the man who is believed to be her biological brother (yes, you read that right). Omar is running to replace Ellison in Minnesota’s 5th Congressional district. It’s fun to connect these dots. According to FEC.gov, Everybody Counts Everybody Matters PAC total receipts amounted to $94,000 for the coverage dates between January 1, 2017 to June 30, 2018, with $81,300 coming from the Keith Ellison Campaign Fund. The Keith Ellison Campaign Fund also gave $165,795.33 to Ellison for Congress during that same time period. During his bid to become vice-chairman of the DNC, the Huffington Post reported Ellison’s campaign raised money through three accounts: Ellison for Congress which is Ellison’s federal campaign committee; Everybody Counts Everybody Matters PAC, Ellison’s federal leadership PAC; and Keith for DNC, a joint fundraising committee. A joint fundraising committee can be created by two or more candidates, PACs or party committees to share the costs of fundraising, and split the proceeds. As a leadership PAC, Everybody Counts Everybody Matters also gives 100% of its money to only Democratic candidates. Open Secrets.org states “by making donations to members of their party, ambitious lawmakers can use their leadership PACs to gain clout among their colleagues and boost their bids for leadership posts or committee chairmanships. Politicians also use leadership PACs to lay the groundwork for their own campaigns for higher office.” Open Secrets revealed Democrat Angie Craig who is challenging Republican Congressman Jason Lewis in Minnesota’s 2nd Congressional District received $10,000 from the PAC in 2018 and Democratic Senator Doug Jones of Alabama, who won his race against a “Kavanaughed” Roy Moore received $2,700 from the PAC. Similar to Supreme Court nominee Brett Kavanaugh, the Democrats were out to get Republican Roy Moore, and he was suddenly accused by nine women of sexual misconduct just before the election which derailed his campaign. We are seeing a pattern here. 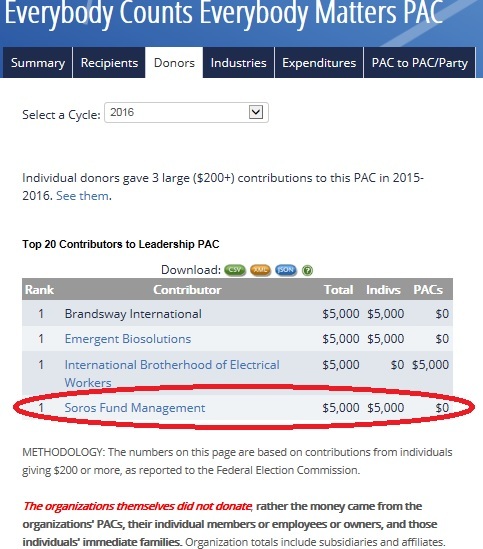 What’s most revealing is that one of the top contributors to Everybody Counts Everybody Matters in 2016 was the Soros Management Fund. You’ve heard the name Soros before. He’s the multi-billionaire who is hell-bent on destroying America by controlling the Democratic party and its leaders. Soros was also connected to the Secretary of State Project which was formed in 2006 by liberal activists to put Democrats in charge of state election offices in key states. Minnesota was one of those states. The Secretary of State’s office is where key decisions are made on which ballots are counted or not in tight election races. Remember the Franken/Coleman debacle in 2008? Thanks to the Secretary of State Project, Democrat Mark Ritchie became Minnesota’s 21st Secretary of State and decided the U.S. Senate race in Al Franken’s favor. It’s not who votes that counts, but who counts the votes. And we all know how well that turned out. I’m digressing down a rabbit hole. Getting back to Ellison’s PAC, I wonder what Karen Monahan thinks of the name? She apparently does NOT matter. Monahan’s voice is being ignored. Despite having a doctor’s note, witnesses, and outright naming Ellison on social media posts as the man who verbally and physically abused her, she doesn’t count or matter to Ellison or the Minnesota Democrats or even the Minneapolis Police Department (MPD). Using the excuse of “a conflict of interest,” the MPD said in a statement they will not be handling the matter involving Congressman Keith Ellison because Ellison’s son Jeremiah serves on the Minneapolis City Council. The MPD made their decision not to investigate out of an “abundance of caution.” The Dakota County prosecutors said they might review the Monahan allegations, but only if Minneapolis police investigate it first, and since the Minneapolis Police said they won’t be investigating, then its likely that Dakota County prosecutors will do nothing as well. 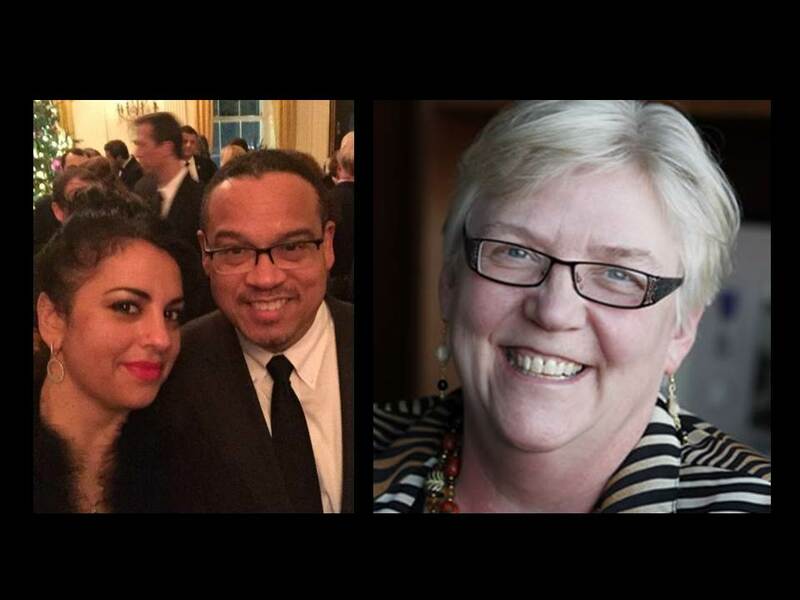 This week, an investigation by a Democratic Party linked attorney concluded the allegations against Ellison are “unsubstantiated” because Monahan did not produce the video of the abuse she endured. It’s like a bad game of “Domestic Abuse Hot Potato”. Why is Keith Ellison putting the DFL, DNC, the people of MN and his family through this? Keith knows every word I said was true. It is abusive and re-victimizes survivors. People will sell their soul for power…. We, the Deplorable Housewives of the Midwest, believe Karen Monahan. She has been sincere. Her story has been consistent. She has posted ample proof on social media that she suffered at the hands of Keith Ellison. She is more believable than Christine Blasey-Ford, yet no Democrat is demanding that Ellison remove himself from the Attorney General race. It should be noted that Ellison is considering leaving his DNC deputy chair position to concentrate on the Attorney General race, which should scare anyone with a brain. So, Mr. Ellison, if you really believe Everybody Counts and Everybody Matters, don’t ignore and dismiss Karen Monahan. And neither should the voters this November.